Update as of 1/24/2014: Delay in Bridge CLOSING due to weather forecast per MDOT - M-63 Blossomland Bridge closed for repair February 3rd - February 5th - The time of repair will start at 9:30am on February 3rd. Construction continuing through Feb 14 & may be down to one lane traffic. Update as of 1/13/2014: Michigan Department of Transportation notified us of a new progress schedule for the M-63 Blossomland Bridge construction. A new start date for work under the roadway surface that will not effect traffic is today, Monday, 1-13-14.The anticipated closure of the bridge and implementation of the detour is for the week of 1-27-2014 as much as the entire week, but likely less. As the dates draws closer, they will provide us with a more specific date for the start of the closure. After the closure, the roadway will reopen with possible lane and sidewalk closures to allow for room to place the equipment necessary for steel painting operations. The entire project is scheduled to be complete on 2-14-14. Update 1/6/2014: This work is being delayed due to inclement weather. Please check our web site for updates and further details. 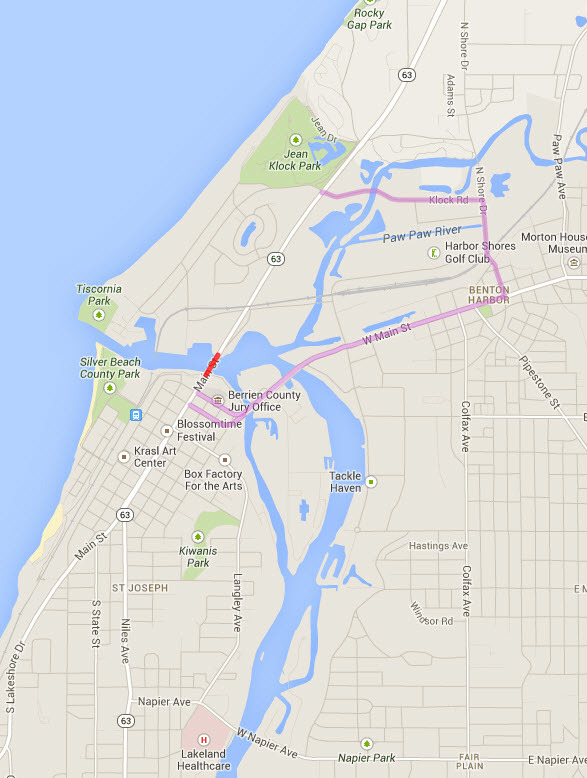 Original message 1/2/2014: The Michigan Department of Transportation (MDOT) will be repairing parts of the M-63 Blossomland Bridge over the Saint Joseph River in St. Joseph, Berrien County, from Monday, Jan. 6, through Friday, Feb. 14. As a point of reference, between 1/6 and 1/26 there will be lane closures only; however, beginning January 27th through February 1st the bridge will be closed completely. The bridge will be closed between Port Street and Momany Drive from Monday, Jan. 27, through Saturday, Feb. 1. Traffic will be detoured on Ship Street and Port Street, Main Street, 5th Street/North Shore Drive and Klock Road during those times.